Continuity: The first adventure featuring the Nth Doctor and Selene and the premiere of the campaign. Synopsis: When the TARDIS unexpectedly lands on England’s coast, Selene is delighted to have the opportunity to walk by the sea and visit an old-fashioned funfair. There may be something to Doctor’s instant disdain for this seedy place, however. The town is deserted, funfair rides have taken on a life of their own, and the beach is soon bustling with ghosts of the past! 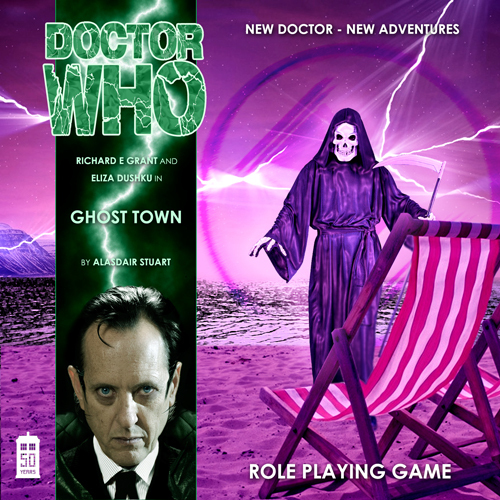 Something insidious is stirring beneath the bay and the Doctor cannot allow the tragic history of this seaside resort to fester any longer. THE VORTEX brought him peace. Selene had observed this ever since she had first stepped inside his astonishing box. He would inevitably find discontent planetside—some quibble or niggle would swell into a lecture on the inelegance of the local architecture or alien cuisine—and ventures into deep space always left him mournfully lamenting the cruel inevitability of entropy and death. In transit, however, there was a freedom that transformed the Doctor and left him blissfully unburdened. With La Traviata echoing throughout the vast chamber of the control room, his voice joining with the tenor’s for the arias, no one could deny it. The familiar wheezing of the central column that had been providing such surprisingly harmonious accompaniment ceased unexpectedly, however, punctuated by an abrupt and unceremonious thwump quite at odds with the Doctor’s playlist.